Structural dynamic tasks often prove to be challenging. This is where one sees the strength of ISMB's interdisciplinary approach. 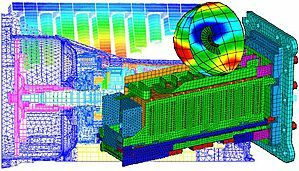 Our team consists of qualified research and development engineers from a range of different scientific backgrounds, thus allowing us to offer simulation services in various engineering areas. We have special experience on solving structural dynamic tasks in the branches aviation and aerospace, automotive engineering, drive technology, medical technology, electrical engineering, power engineering, process engineering, machine construction, machine tool construction, marine engineering, plant construction, power plant construction, turbine construction, compressor construction and the environmental technology. Here you will find some examples of our projects.